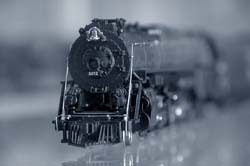 Model trains have been one of the most popular hobbies for many years, especially for boys - and men! Many an adult has a fascination with model trains, and there are clubs, magazines and societies dedicated to the subject across the UK and the rest of the world. Building a model railway layout is a joy for enthusiasts, and there are many suppliers of track, trains, rolling stock and other accessories that keep the market fresh and exciting. While the original model railways, which appeared in the latter part of the 19th century, were clockwork the most popular have been the electric model railways that are very popular today. Every schoolboy in the UK has heard of Hornby, and that company's history is the story of the modern model railway. Hornby is famous for producing accurate models of well known trains and rolling stock and has been in the business since the 1930's. It is by no means the only producer of model railway items, for there are many across the world. It has been the market leader in the UK since it began, however, and continues to be the supplier of choice for both expert and novice railway modellers alike. There are three 'gauges' of model railways that dominate the market, but there are others that are rapidly coming to prominence. The most popular gauge - or scale - of model railways is the 'OO' gauge, or the similar 'HO' gauge used in some parts of the world. This is the scale that Hornby popularised and is now most famous for. This gauge services models that are built to the 1:76 scale, a decent size that is able to show real detail, but one that can also be compact and easy to house. 'OO' is the best selling gauge in the world, and remains a modellers favourite to this day. 'N; Gauge was introduced by the Arnold company in Germany who saw the benefits of a smaller scale modelling range that would appeal to people with limited space. These models are made to the 1:160 scale and are considerably smaller than the popular 'OO' gauge models. Nevertheless, this scale has a strong following in model railway circles as it allows or quite comprehensive layouts to be produced in small areas, and the models are surprisingly detailed. The other popular gauge that has its roots in the early days of modelling, 'O' gauge is the bigger brother of 'OO' and is modelled to 1:45 scale. These models are sometimes used in garden railways and have a strong following, although are not as big a seller as the smaller scales. Lately there has been a rise in popularity of the 'Z' gauge - 1:220 - railway models that are produced by the famous Marklin factory in Germany and some others. These offer the opportunity for genuine table-top layouts and are very versatile. As technology has advanced in all areas of electrical goods so it has in the world of model trains. Whereas layouts were once controlled by crude electrical transformers with simply a speed control, nowadays the modeller is able to purchase complex and effective computer controlled digital devices for activating their layouts. These can allow for the controlling of several engines at the same time, plus other items such as signals, lights and such, and make for a more realistic model railway layout as a result. There is also a big market for collecting antique model trains, and this is an area of collecting that shows no signs of losing popularity. Hornby is widely collected in the UK and the best models are those that come in their original boxes, while original sets - also boxed - with track, engines, rolling stock and accessories are also very collectable indeed. The charm in model railways is in the accuracy of the models and the ability to recreate actual lines and scenes as well as fresh and original designs. Many a father and son pairing will continue to enjoy model railways for years to come. Model Railroading Enthusiast Robert Anderson Reveals Quick & Easy Ways To Design, Build, Maintain & Repair Your Very Own Realistic Model Railroad...without Making Costly Mistakes! Ideal For Beginners & Experienced Model Railroaders In Ho, Oo, N, O, Z Etc Download the Model Train Help Ebook 4th Edition here now. Click here!